Aby is a qualified British Wheel of Yoga teacher and teaches a Hatha Intermediate Flow Yoga class at Leek High School – a flowing style of yoga that harmonizes breath & movement to give strength & agility. Aby incorporates energising flows using traditional poses (asanas), breathing techniques (pranayama) concluding the session with a period of relaxation. Aby creates a class suitable for all levels, some yoga experience helpful as more advanced poses will be explored. 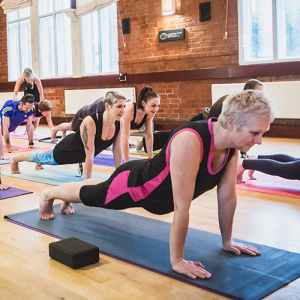 Read more about my Yoga classes in Stoke-on-Trent. Using the spacious dance studio; heated flooring, temperature controlled and variable lighting. To book a class at the Leek High School simply contact us.